Anchoring the Piedmont-Triad region of North Carolina, Winston-Salem’s balance of urban opportunity and natural beauty consistently earns it high national marks for quality of life. With temperatures averaging a pleasant 69 degrees, the “City of Arts & Innovation” is a vital hub halfway between North Carolina’s eastern beaches and western mountains. Winston-Salem, home of the Wake Forest main campus, has been nationally ranked among the best places to launch a business by the likes of Forbes and Money Magazine, and Bloomberg Businessweek included it among the ten most “Fun, Affordable” cities in the United States. Since relocating in 1956 from Wake Forest, NC to the Reynolda campus in Winston-Salem, Wake Forest University has occupied 340 beautifully landscaped acres in the city. Comprising gardens, shopping, dining, services and athletic facilities where the Wake Forest Demon Deacons compete in ACC sports, the Reynolda campus reflects the merger of business and culture that defines Winston-Salem, a hub for innovative biotechnolgy that also boasts a thriving arts and culture scene. The crown jewel of the Reynolda Campus is Farrell Hall, the new home of the Wake Forest University School of Business. The $55 million, 130,000 square foot facility opened in the fall of 2013, integrating state-of-the-art technology and flexible learning spaces with august Georgian architecture to inspire comfortable, streamlined collaboration between faculty and students. 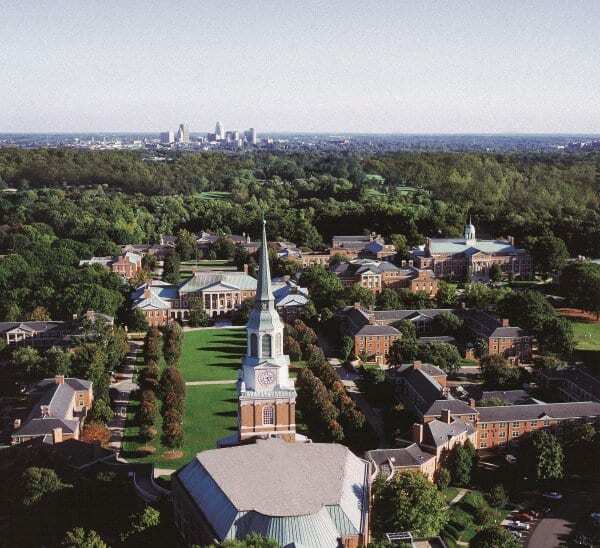 The Wake Forest experience is too important to confine to a single city. Our second campus in North Carolina’s largest city, Charlotte, extends the Wake Forest brand and puts students even closer to concentrations of power in the business world. A major financial center with assets second only to New York, the “Queen City” serves as headquarters for giants such as Bank of America and Wells Fargo as well as professional sports teams such as the Carolina Panthers and the Charlotte Hornets. Responding to a tripling of its MBA student population since 1995, Wake Forest University relocated its Charlotte campus to nearly 30,000 square feet of space in 2012. Residing near some of the city’s most influential businesses, steps away from the diverse shopping and dining options of uptown Charlotte, this urban campus provides practical convenience and state-of-the-art services to the busy working professionals enrolled in our programs. 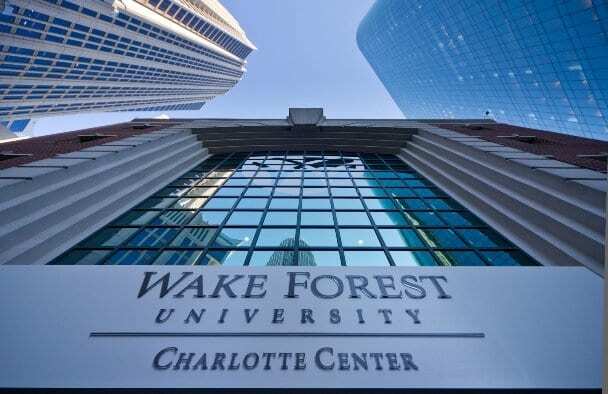 Learn more about the Charlotte Evening MBA and Charlotte Saturday MBA as well as Executive Education programs available at the Wake Forest University Charlotte Center.